Bahnhof ST is focused on local commitment. This commitment is build up through involving, educating and employing domestic São Tomé staff. Bahnhof ST, CEO and Managing Director is Aguinaldo Salvaterra from São Tomé. Bahnhof ST provides technical cutting edge Internet knowledge through partnership with a Swedish cooperation. This is important for the initial investment and it gives superior international technical expertise, and a solid long-term relationship. Space segment is acquired from Lockheed Martin Intersputnik. This is a joint venture between an American Company and Russian interests. Bahnhof ST has reserved space segment on LMI-1, launched from Kazakhstan from the Cosmodrome in Baikonur. The service is intended for firms, organizations and some parts of the public sector. By using wireless technologies Bahnhof ST can bypass a very costly and time-consuming part of infrastructure construction: digging copper or fiber optics into the ground. Services for the duty free zone! A necessary condition to establish a "Duty Free Zone" is not only tax incentives. Foreign investors demand Internet capacity with international quality. Bahnhof ST could suit their needs. Marketing São Tomé as a tourist paradise! Bahnhof ST has complete support from the government of São Tomé, especially from the minister of tourism, regarding the development of Internet as a promoting and marketing tool for tourism. The ST country code domain is also used as a powerful tool to accomplish this. Bahnhof has also developed a separate tourist site. Cyber-caf� with professional and skilled technical assistance is available upon request. However, please note that our main services are targeted to residents of São Tomé and Principe. As an expression of Bahnhof ST serious interests in developing Internet in São Tomé and Principe Bahnhof ST will provide the Parliament with wireless connections for free. Administrative services also involves e-mail services (and if required establishment of web-site for the administration). Free Internet University for education of students! Bahnhof ST provide free web-hosting space on powerful servers for all qualified students in São Tomé and Principe. 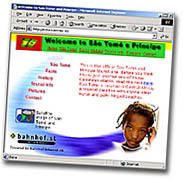 Bahnhof ST Internet School is open since April 2000. More schools are in the process of being connected. The intention is to educate young people in Internet technologies.